Join us for our 16th Annual Vegan Thanksgiving Potluck at Matthews Park Recreation Center in the Seward neighborhood of Minneapolis. This event is open to all of our supporters, donors, volunteers, families, and friends. The event is free to attend but pre-registration is required. Get your free ticket here. 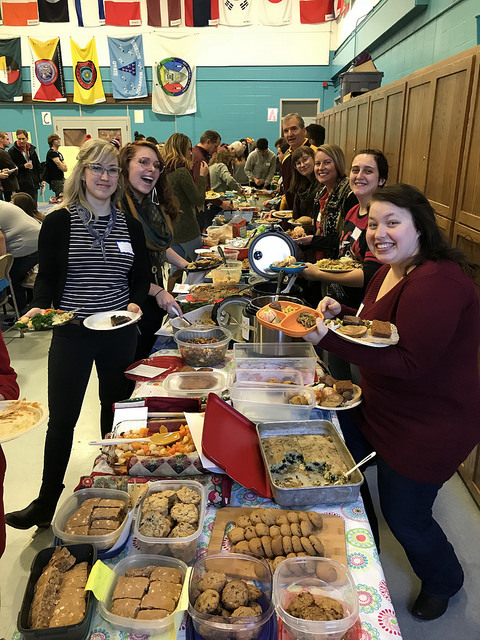 Our annual Thanksgiving potluck is an opportunity to enjoy an abundant array of delicious vegan food alongside with members of our thriving compassionate community. We’ve got plenty of reasons to be grateful! If your last name begins with A through J, please bring a main dish or salad. If your last name begins with K through R, please bring a side dish or appetizer. If your last name begins with S through Z, please bring a dessert or beverage. Please bring your own reusable plates and utensils. We will provide some compostable plates and utensils as back-up, and will be composting to minimize waste. This event is funded through gifts from people like you and student service fees from the University of Minnesota.